When it comes to chicken, I am normally a wing and breast woman. However, where barbecue chicken is concerned, I go straight for the drumstick! There is just something about a drumstick smothered in barbecue sauce that makes my mouth water. This is another of my mother's recipes. I personally call them Dreamy Drumsticks because they incorporate two things I love: fried and barbecue chicken. Unfortunately, I am not allowed to disclose the recipe to my mother's barbecue sauce. Therefore, I will direct you to this barbecue sauce recipe from Chef Michael Symon: Michael Symon's Cleveland BBQ Sauce. In a resealable plastic freezer bag, add your dry ingredients. Shake the bag for a minute to mix the ingredients together. Heat oil in a large skillet to 350 degrees. Place drumsticks in the bag and shake to lightly coat the drumsticks. Carefully place each drumstick into the hot oil. Fry the chicken uncovered for 15 minutes. Turn the chicken occasionally to brown evenly. While chicken is frying, preheat oven to 350 degrees. In a 15 x 10 x 2 inch rectangular baking dish add the partially cooked chicken. 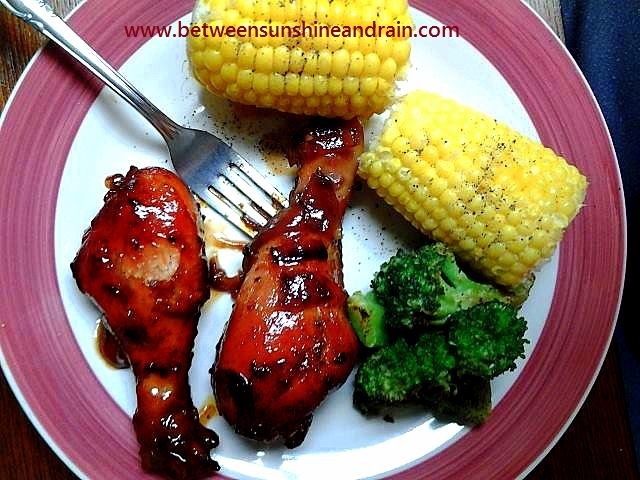 Pour your barbecue sauce over the chicken, turn the chicken to make sure all sides are covered in sauce. Place in the oven and bake uncovered for 20 to 25 minutes. These drumsticks are so deliciously good. If you do not want to make your own sauce then use your favorite brand of sauce. I like to eat these drumsticks with potato salad and green beans. You do not have to partially fry these with a light coating on them either. These are just as delicious when seasoned with the dry ingredients, except the corn meal, then pan seared in the skillet before transferring them to the oven. In fact, that is the version seen in the main image. How do you like them prepared?